首先, 買了「讓我閃耀」門票未? 六隊優秀無伴奏組合正在努力練習, 希望帶給你們最好的音樂和表演! 十月十二號在理工大學賽馬會綜藝館見! First of all, have you bought tickets to the 'Time to Shine' show yet? Six a cappella groups are currently working hard to show you the best of what they can do! Do join us on October 12 at the Polytechnic University Jockey Club Auditorium. Tickets can be found at Cityline (online, link above) or at Parsons Music stores. Hope to see you there! 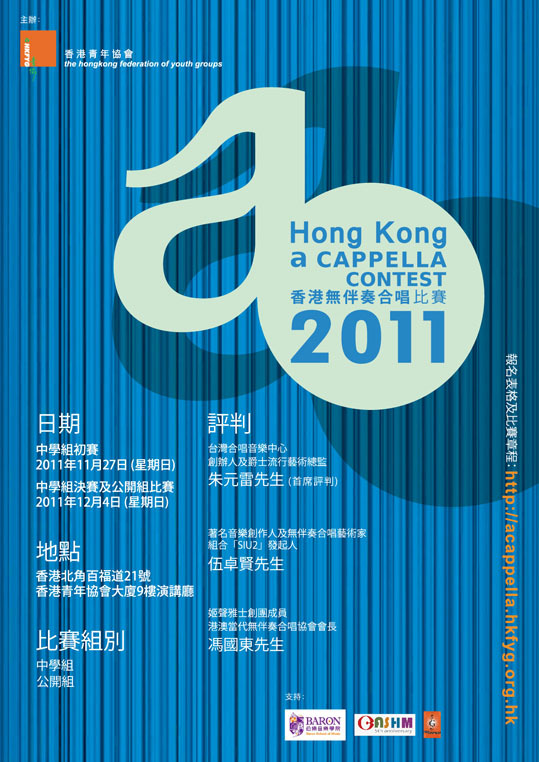 Also, we are happy to announce the HONG KONG A CAPPELLA CONTEST 2011! 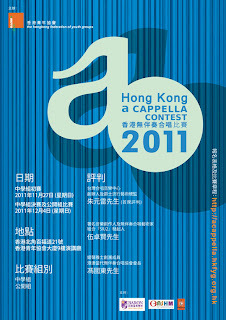 We are very honoured to invite three renowned judges this year, including Mr. Ray Chu (Artistic Director, Taiwan Choral Music Center), Mr. Fung Kwok Tung (Chairperson of the Contemporary A Cappella Society of Hong Kong and Macau), as well as Mr. Yin Ng (Renowned composer and a cappella artist). As in past years, the Contest has two Divisions, the Secondary School Division and Open Division. Please note that this year's Open Division welcomes groups with a maximum of 10 members. What's more, competing groups may also be invited to a Christmas a cappella Marathon performance opportunity! We hope to see your team on December 4! 去年Noteworthy來香港表演, 今年其中兩位Amy和Laina上了美國無伴奏合唱比賽 The Sing Off, 她們真是很厲害喔! To wrap up this post, here's a wonderful clip from NBC's The Sing Off, featuring two singers that came to Hong Kong as part of Noteworthy last year, Amy Whitcomb (on lead vocal) and Laina Walker.